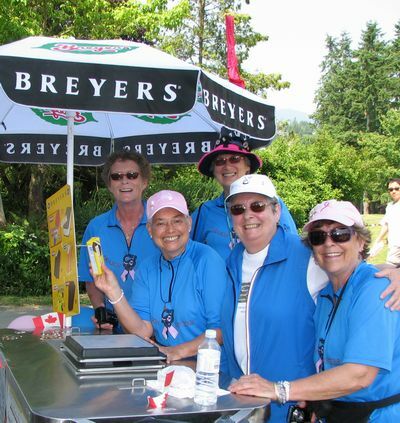 Members of the newly formed North Shore Dragon Busters, Gail Miles (left), Leanne Jacobsen, Susan McMinn, Barb Wallace and Louise Moreau, gear up for a practice in Deep cove. 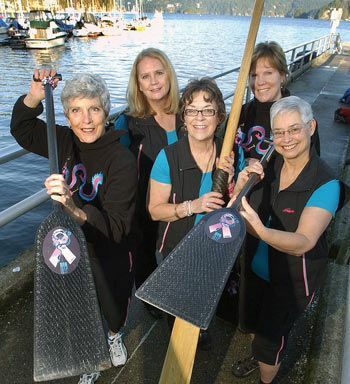 A new community-oriented, North Shore-based dragon boat team comprised of breast cancer survivors is looking for members. 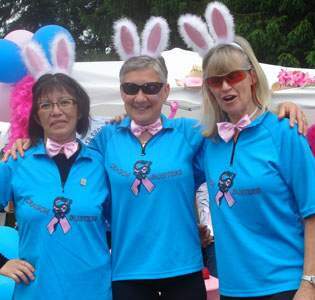 The North Shore Dragon Busters have just begun practising out of Deep Cove and communications committee members Leanne Jacobsen, of West Vancouver, and Louise Moreau, of North Vancouver, are incredibly excited about the new team’s potential. Jacobsen and Moreau say the Dragon Busters will take an active role in the North Shore community by being part of various community days and participating in fundraisers in order to raise awareness and reach out to other women and their supporters. Most members of the Dragon Busters were formerly part of Abreast in a Boat’s “Abreast in the Cove” dragon boat team, including Jacobsen and Moreau, who with the team earned some bragging rights at Abreast in Australia 2007, held in the fall. They finished fourth out of 74 teams from around the world, and came first among the North American teams. Jacobsen says being part of breast cancer dragon boating becomes an integral part of the lives of all those involved. She’s been active for the last six years following a diagnosis in 2001. For women who’ve been through a breast cancer diagnosis, gone through treatment and been surrounded by health care professionals, coming out on the other side and being left on their own can prove to be quite overwhelming, says Jacobsen. I think a lot of women are still very nervous at that time, wondering if this ache and pain means its come back, she says. At least for me what dragon boating did was it first of all got me much fitter than I had been in the past and secondly it gave me a group of women that if I was worried at all, I could talk to. There was support, there was caring and friendship. It just made such a difference in my life and I think in the lives of all of us which is why we’ve continued together on this journey. Moreau was diagnosed in 2002 and became active in dragon boating the following year She says its not extreme to say that being part of a survivor dragon boat team gives women their lives back. It takes a tremendous amount of courage to go out there and accept the challenge of trying something new and by rising to the occasion, participants feel a strong sense of empowerment she says. Jacobsen and Moreau are encouraging all breast cancer survivors, regardless of age, athletic level, or experience to sign up for the team. Competition really doesn’t enter into it, says Jacobsen. 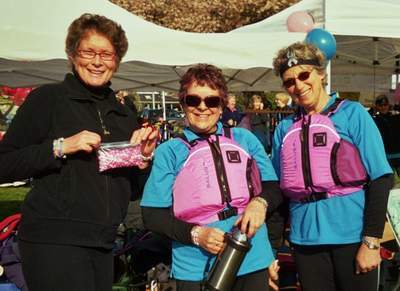 ‘We’re looking for women who’ve never paddled before, who just want to experience what we’ve experienced with the support that we’ve received paddling with a breast cancer dragon boat team. Jacobsen says through her involvement she “found her inner athlete”. In addition. Moreau says they have a lot of fun, citing potlucks, opportunities for travel and the obvious camaraderie as drawing cards. The North Shore Dragon Busters currently practice Saturday mornings and in April they’ll add Wednesday evenings to the mix..